Yesterday, I was able to go out on a launch and continue with the hydrographic survey around Belkofski Point with Ensign (ENS) Tim Smith as the Hydrographer in charge (HIC), Jodie, our Coxswain, and Fernando, a Hydrographer in training. They use a lot of acronyms here on the ship that I’m learning. We worked a long day until about 5:30 p.m. since the weather was nice and seas calm. The weather can change quickly in this area, so the survey team tries to work as much as possible when it’s nice out. Captain Don Haines and the crew are very safely conscious and we have already practiced several drills and we have a morning safely meeting before going out on the launches. On the first day out, I was issued a hard hat, survival suit (sometimes called a Mustang suite), life vest or PFD (personal floatation device) and float jacket. When boarding the launches in the morning, we don the float jacket and hard hat. Once the launches are in the water and we have moved safely away from the Rainier ship, we can switch to our life vests (PFD), which are more comfortable to wear on the small boats. Drills: We practiced three drills while in route (or transit) to the Pavlof Islands; man-overboard, abandon ship, and fire. There is a different ship bell ring pattern for each event. When theses drills or event occur, all hands (crew) meet (muster) at a pre-assigned location. The person in charge at our muster locations marks off if we are there. This system of accountability ensures that all personal is accounted for and safe. The fire drill was interesting to me since I’m a volunteer fire fighter/EMT on Whidbey Island where I live. They use much of the same equipment as we do to fight fire including bunker gear (fire pants/coat/helmet), SCBA’s (self-contained breathing apparatus) and masks. One of the crew demonstrated how to put on the SCBA and mask. 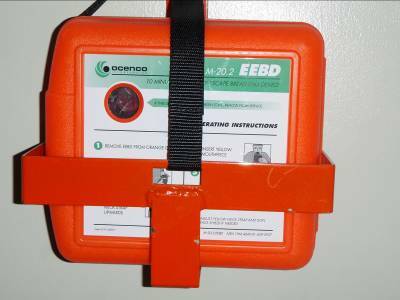 Another safety air supply device is called an OCENCO EEBD. 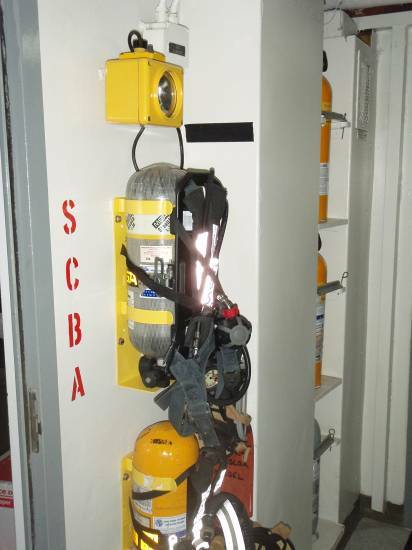 These 10 minute air supply systems are located all over the ship and would give someone enough clean air to exit the ship if an accident occurred. Josh gave me a tour of the engine room and explained the basics of how the ships power is produced and maintained. From a control room, the ship’s engine controls can be monitored by computer. 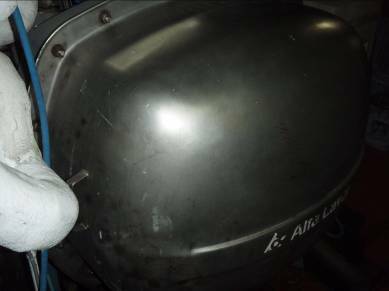 Every hour, the crew inspects the engine and support components and ensures that everything is running smoothly. The area was loud, so we wore protective earplugs and it was also very clean considering all the oil that is used in the system. Desalination System: Another interesting aspect of the ship is how the process water. All fresh or potable water is made from salt water in an apparatus called an “Evaporator”. Salt water is pumped into the evaporator and heated up to about 175 degrees. Because it’s under pressure, the water boils at this lower temperature instead of the usual 212 degrees. The heat comes from generators that help create the electricity on the ship. So, the whole system is very efficient. Large 8000 gallon storage tanks hold the fresh water afterwards. The evaporator produces about 500-550 gallons of fresh water per hour, so there is always plenty to use and it tastes good. It was very informative for me to get a tour of the engine room today and learn how the ship’s power is produced. Josh has the job of an “Oilier” and is only 23 years old. He had an interest in welding and mechanics and has a high school degree. Garret is the “First Engineer” and also has a high school degree. Both men enjoy working for NOAA and explained that many men and women learn skills on the job. They stressed that you don’t need a college degree to work for NOAA, but it helps to have an aptitude for the job they are interested in such as working the engines. Yesterday, several of us were able to scout out an abandoned settlement near to where the Rainier is anchored after dinner. It is called “Native Village of Belkosfski”. Originally built for the fur trade in the 1860’s, it later became home to native Americans There were several old wooden structures and one larger cement and brick building that was the school. Judging from the date on one of the food items in a kitchen, this area was inhabited in the early 1980’s last. It’s amazing to see that many structures were still standing given the harsh climate around here. More information can be found here. The teacher who taught there in the 60’s/70’s talks about his life there. 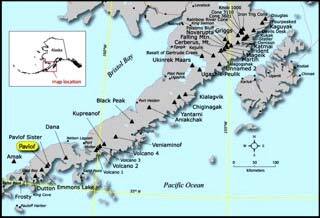 According to the Global Volcanism Program, Pavlof volcano erupted in August 2007. 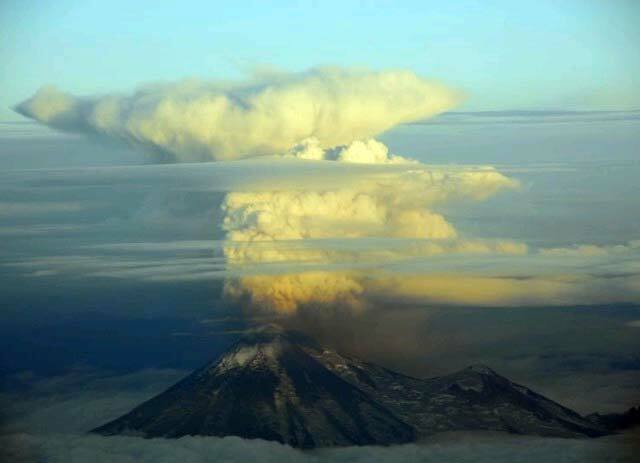 NOAA’s satellite imagery recorded ash plumes and lava spewing from Pavlof and lahars or mudflows occurred. The attached pictures are from Global Volcanism’s website, listed on the next page. 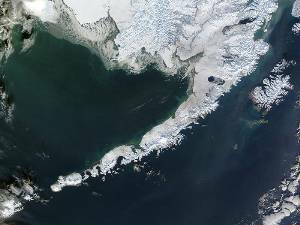 Questions of the Day: How do volcanoes shape the southeast strip of Alaska? How active are they and why are they active? This entry was posted in 2008, NOAA Ocean Service, NOAA Teacher at Sea, Terry Welch and tagged Alaska, CTD, engine room, humback whales, humpback whales, Hydrographic survey, multibeam sonar, noaa ship rainier, pavlov islands, seafloor mapping, volcano. Bookmark the permalink.